The Orgatec fair is over for this year. It was an epic event During the week we saw many new fascinating things, exceptional products and met many designers, agents, resellers, interior designers and other important people in the business. The week went by fast. Next up is a short presentation (especially for those who do not know what Orgatec is) of Orgatec, what we did and presented there during the fair. In 2016 there were participants from 118 countries. In 2018 was the amount 142. The visitors' growth is different in each part of the world but the growth in Europe was about 33%, more precisely the visitors' number in Eastern Europe countries doubled. Altogether there were participants from 39 countries. The fair was visited by 63000 people. The next Orgatec fair will take place in the year 2020, during the timeframe of 27-31 of October. 7) NEW! RayBoy chair and swing seat Tuular. The stand was designed by Elmet Treier, who made also the products RayBoy and Tuular. RayBoy is the younger brother of Ray bar stool, which means that it is a chair with a lower metal frame but also with bent plywood components. The chair is suitable for bars, restaurants, kitchens, offices or other public spaces. Tuular is a great swing seat that is a fun addition to the office, home or other environments that need a nice centrepiece in the interior. Let's be honest, if you are in the office and wish to relax a bit, the Tuular is a perfect place to sit and remember your childhood. There is more info about each product on the Tarmeko Nordic trademark site. P.A.N.U chair and table set, which is designed by a young Finnish designer Panu Kiukkonen, is meant for schools, more precisely for children aged 11-14. 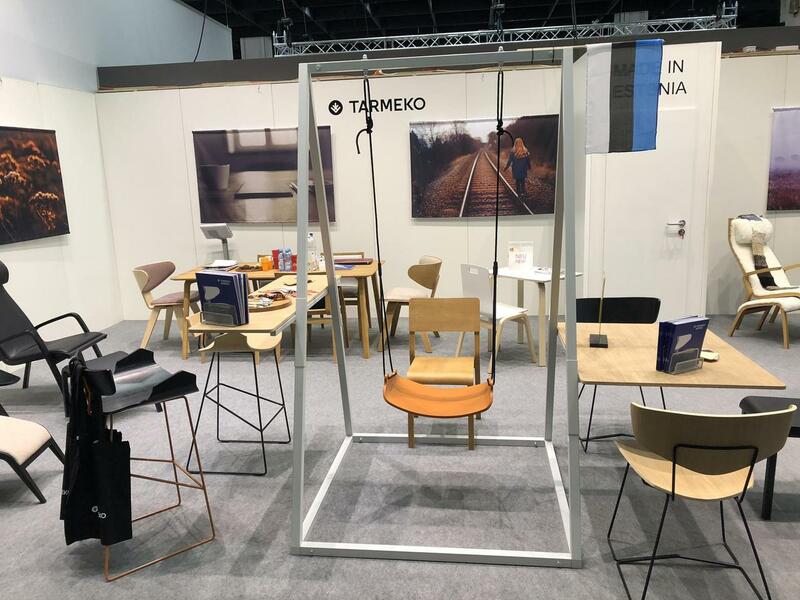 The products are suitable for classrooms because the table and chair are light, with practical design and enable the children to study and play in a comfortable environment. 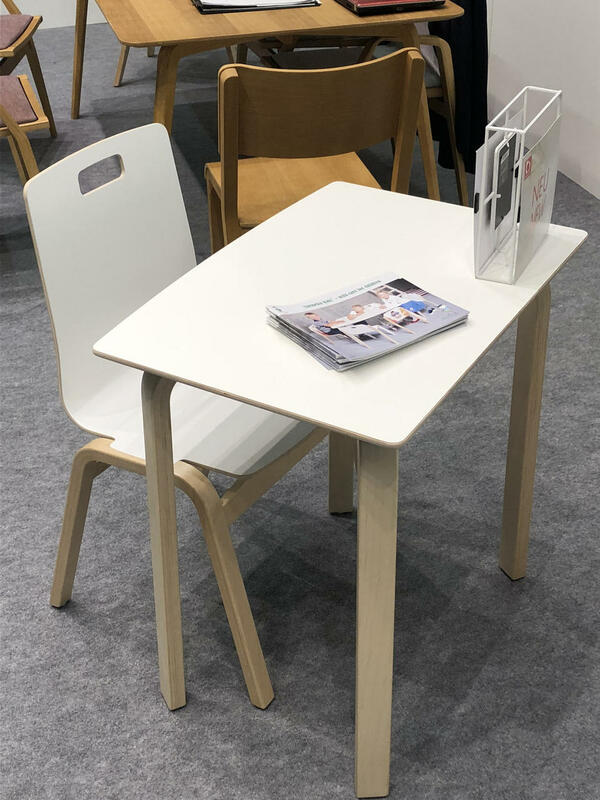 The chair and table are covered with white laminate that is an innovative solution at the moment in the children furniture industry since it is easy to clean and is effective. Many good things in one! At the fair, we presented the first ever prototypes and we will make some alterations (we will add a side shelf for the books) but all in all the products should stay as they are. To conclude, the fair went well: we got new contacts, a lot of feedback and of course a positive experience! If there are products that interest you or if you have any questions, please do not hesitate to ask! We will reply asap! :) Write us an email on sales@tarmeko.ee. In the meantime, we wish you the best.